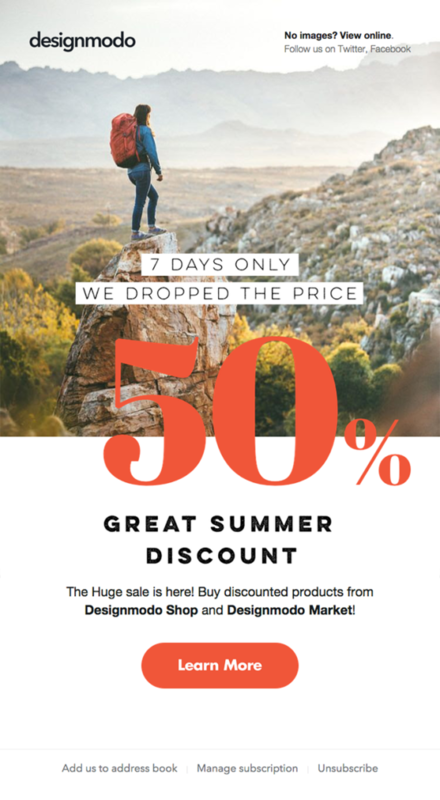 Summer sales time is approaching: for e-commerce websites, retailers and much more, it’s time to make the most of the combined potential of email and SMS messages. Let’s see how to reach more customers, increase conversions, and encourage repeated purchases during the sales season. For retailers and e-commerce websites, the summer sales season often brings a breath of fresh air in the midst of the physiological drop in sales that comes with summer. But what if you could increase the volumes and sales guaranteed by discounts, in just a few simple steps? 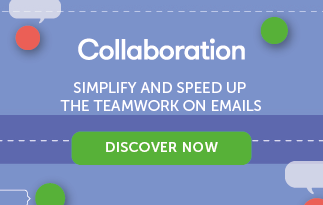 You can, by creating an effective synergy between your email and SMS channels. Here are 9 ideas for leveraging the SMS channel – plus email – during the summer sale season. SMSs also exceed one of the main physical limits of the email channel during the summer period, which is the drop in performance caused by people being away from their desks. SMSs don’t rely on a computer screen, they reach recipients everywhere – on the beach, on a trip, by the pool. So why not take advantage of their significant potential in order to give your summer discount campaigns more impetus and incisiveness? Today we’re offering you nine ingenious, but simple, ideas to put in place; if they work well, perhaps they’ll help you pick the pace back up and also adapt to the rest of the year. Remember: the prerequisite to effectively using the SMS channel lies in the integration between e-commerce, CRM or CMS and sending platform. In doing so, data relating to personal information, purchasing history, and interest can interact, maximizing the accuracy and effectiveness of communication strategies. In your contact database, each recipient is different for their identity, habits, interests, and purchasing behavior. So it doesn’t make much sense to send the same promotion to everyone. Instead, try to segment SMS deliveries with ad hoc offers based on different criteria: gender, geographic origin, average receipt, or preferred merchandise category are just a few examples. Precisely because SMSs unleash their full potential, integrating this channel’s deliveries with emails is good practice. With automatic workflows, it’s very easy to do this: choose the triggering event, select the messages, set the waiting times, and the stage is set. Making users feel special is a great way to increase their propensity to buy. So you can use SMSs to send an exclusive coupon code that gives a customer access to private promotions, such as a discount or a gift. If you have an app, you can do the same thing by reserving special deals for mobile purchases. For greater effectiveness, follow up with users who use the discount code and send additional promotions. Vacations, free time on social networks. A great way to promote sales is by fostering users’ engagement and sharing of social content. Choose a theme and a hashtag for your game, contest, or challenge. Use an SMS to ask the contacts in your database if they’d like to participate in the summer challenge. All they have to do is answer YES to the SMS to receive the subsequent instructions. Use SMS messages to send instructions for the challenges to be completed (on alternate days, for example) related to your product or the summer sale theme. Ask users to share a photo of each of their completed challenges on social networks. Each photo is worth an additional discount at the store. A simple, fast, and effective technique to increase your brand awareness on social networks and promote word-of-mouth about your sales. It’s fun for everyone! As we all know, sales don’t last very long, and the best products run out first. Emphasize the urgency, highlight the deadlines, and leverage the so-called FOMO (fear of missing out), which is an extremely effective sales technique in this context. Always specify the limited duration of the discount and its exclusivity, indicating (when applicable) the expiration. 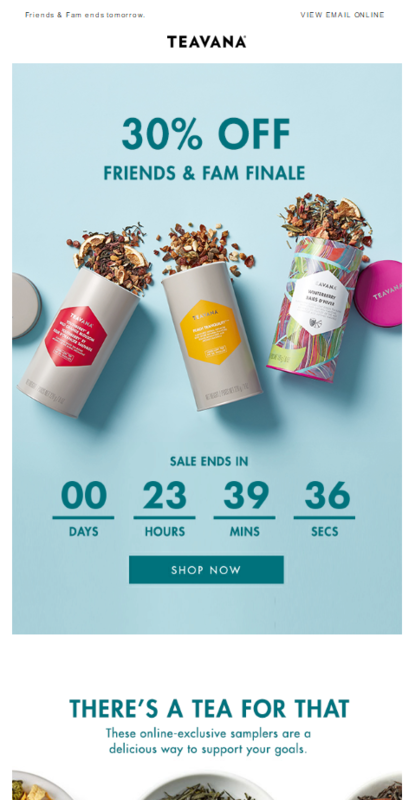 Take advantage of emails’ additional graphic freedom to insert a countdown timer until the end of the discount period. Guaranteed efficiency! Apply a geographic filter to your database and send specific promotions to those who live near a specific store. Use purchase history information to send offers to those who made a purchase in a specific store (perhaps they don’t live there, but pass by often!). Include a link to a map or the “find store” page of your website in the SMS. Use a dynamic field to customize the store or location name in the SMS. Go back to number 3 of this guide, and offer a special discount to those who come into the store with the coupon sent via SMS. If the 160 characters available in an SMS (extendable to 470 with MailUp) are too restrictive, you can add a link to an external landing page to each message. This way, you’ll have all the space you need for additional content. Request feedback on their purchase via a link to a web page or in inbound mode (for example by asking them to respond to the SMS with a rating of 1 to 10). Not just SMSs: the mobile world is full of opportunities to seize to promote your sale campaigns. Insert a QR code on flyers, posters, and other media: by scanning it, users will unlock a special promotion or exclusive discount code that will prompt them to make a purchase. Take advantage of beacon technology to intercept users who are passing near your store. You can send them the notification of an ad hoc promotion and increase the chance that they’ll enter your store. Like chocolates, one leads to the next. Ask your subscribers to forward the discount code to friends and family: for each new customer they bring in, they’ll get an extra discount. Text messaging is great for being attentive to the relationship you have with your customer: support requests, return notifications, feedback, and suggestions are ideal in the SMS channel. Not just SMSs. Emails offer the necessary support to SMSs for highly effective campaigns. That’s why it’s crucial to see the entire campaign with a cross-channel perspective, maintaining a common thread in terms of themes, copy, and communication between the two channels. We already discussed this on our blog last year here, and today we’re here to update the gallery of emails that we think hit dead-center when it comes to sales. What: an image-only email, with a fun graphic background of small pineapples. It addresses a segmented audience of aficionados who already know the brand and its products, so it doesn’t bother showing them in detail. Why we like it: it’s simple, it’s summery, it’s effective. The copy gets straight to the point, without dancing around it with words. The lower box is also useful, which sends recipients to the “Find your store” page of their website. What we would improve: image-only emails run the risk of not being seen at all if the recipient’s image display is turned off or for some reason isn’t successful. We would have extracted the call-to-action in HTML in a section by itself, so that it would be visible under any circumstances. 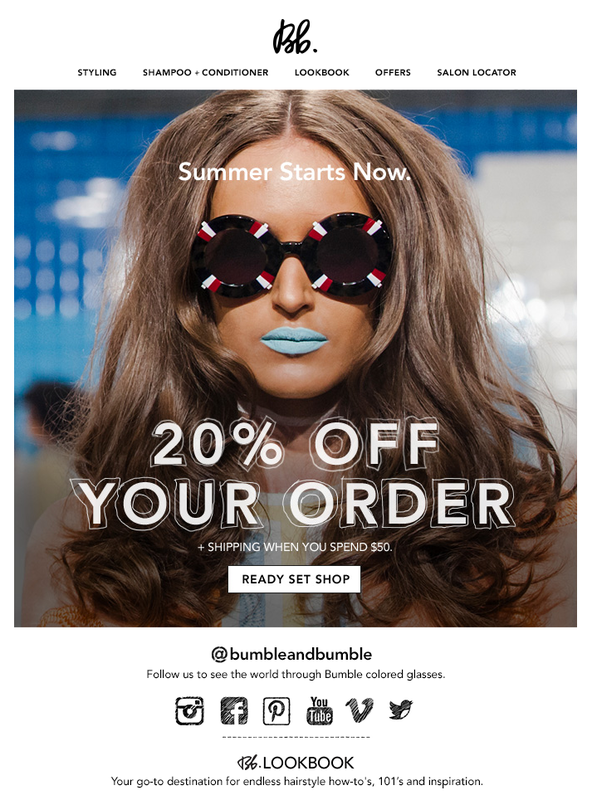 What: this brand also goes for an image-only email, highlighting the discount with a playful font and minimal copy. Why we like it: because it’s daring, and certainly doesn’t go unnoticed. Creativity always brings rewards: we’d love to find out the click-through rate of this message; regardless, the email leads us to think that it was above average. What we would improve: just like in number 1, we would have extracted the call-to-action to make it bulletproof. Additional blocks beside the main one could also add more context to the message. What: a minimal email in the brand’s style with a great game between the images of product and copy. It stresses the urgency of the expiration date by using a countdown timer. Why we like it: because it uses the background color very well in HTML so that the image is perfectly integrated with the background of the rest of the email. The timer is also always a great idea: find out how to insert it in messages here. What we would improve: pretty much nothing. What: an email with high visual impact thanks to the choice of a great opening image. The HTML block of text follows with the call-to-action to learn more about the promotion. Why we like it: because it’s simple, but very effective. It resolves the image vs. text issue quite well, using 50% as a connecting element between the two. Another interesting aspect is how they chose to place the opening text via a browser (top right), thereby saving space. What we would improve: the wording of the call-to-action is a bit weak for an email that should urge a recipient to make a purchase. 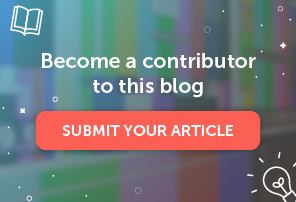 Learn more or Find out more are rather soft calls-to-action, and are preferable in more editorial contexts or when enticing a recipient to learn more about the product. A little bit more aggressiveness here wouldn’t hurt. Also, there’s no real reason to place the social sharing text at the top right (even worse, without icons), where it’s slightly out of place. 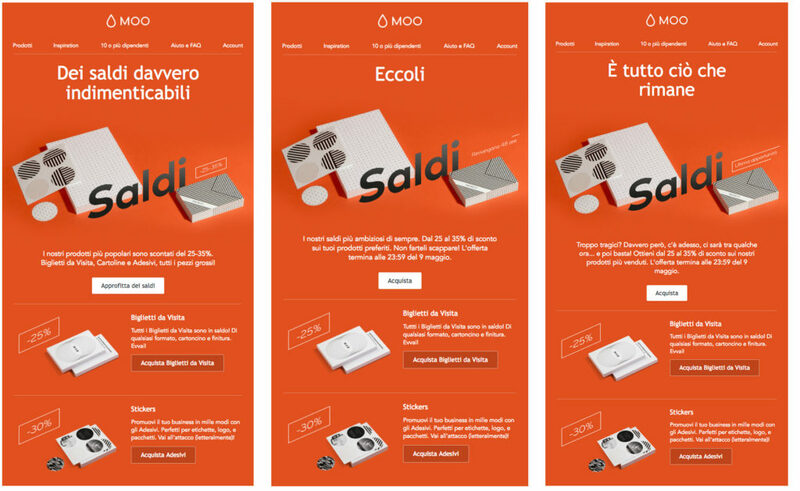 What: Moo uses an effective drip campaign for its summer sales, repeating almost identical graphics in three emails sent every few days. What changes is the copy: the main text, the copy in the introductory paragraph, and within the GIF. Why we like it: it’s always a good idea to use a drip campaign: it reinforces the concept in the recipient’s mind, maximizing the campaign’s persuasive power. The use of color in the background is also great (which we will dedicate a blog post to shortly, stay tuned! ), as is their choice to add vitality to the message (already lively because of the color chosen) with an animated GIF. What we would improve: we would change the call-to-action text and the quality of the blocks underneath the main section (Business Cards, Stickers, etc.) by alternating graphics or the product category order. The summer sales season offers an exceptional opportunity to take advantage of 100% of the potential. If emails are a great way to help with the conversion, SMSs can provide the ultimate push for even better results. Our advice is therefore to integrate the two channels by building a strategy that best calibrates communications according to recipients’ willingness to buy and the urgency you want to instill in them. As content creator at MailUp, my mission is to make email marketing strategies accessible, useful and interesting for everyone, newbies to experts. Behind every 'send' button there is a complex world, and my goal is to unravel it for marketers. I am an avid reader, a restless traveller, a self-confessed grammar nazi and a proud cat owner.